Through their industry leading work in developing dairy herd health programs and farm consultancy, Drs David Beggs and Mike Hamblin have developed a range of farm management software programs to assist dairy farmers improve their farm efficiency, production and profitability. The range of software includes Dairy Data, Farm Data and Farm Cash, which together form a suite of software solutions to improve the way you manage and record herd, pasture and financial events for your farm. A range of informative and detailed reports are easily generated from a set of pre-designed templates, which means you can quickly work out how your herd, paddocks and budgets are performing. Inconjunction with our full Farm Consultancy services, these software products are indispensable for your farm management systems. A Dairy Herd Health Programme for seasonal calving dairy herds. > Allows for rapid, simple data entry. > Allows once only data recording. 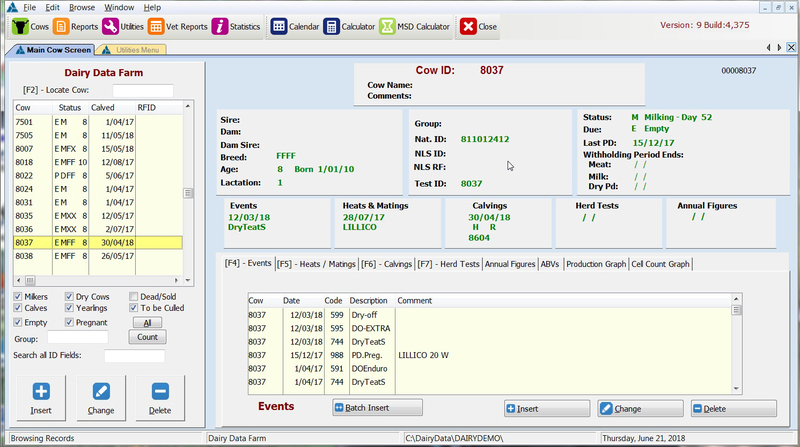 > Allows on screen display of all herd test and cell counting data for each cow. > Vet check list - cows in need of a Vet. Annual farm analysis of performance is available from farmer’s vet or by Warrnambool Animal Production Services and allows calculation of all relevant indices, disease and production records to produce an annual report. Dairy Data can be run as a bureau service with data being entered commercially by Warrnambool Animal Production Services, your own veterinarian or possibly your herd testing centre. Reports can be run at your request and faxed, posted, or emailed to you. Several leading Veterinary Clinics have an advanced version of Dairy Data that can analyse reproductive performance, mastitis control, and can produce Ferility Focus Reports. Farm Cash is an accounting package specifically written for farmers, particularly dairy farmers. The programme has been written locally in Western Victoria by veterinarians David Beggs & Mike Hamblin, primarily to obtain data to allow benchmarking of client’s performance. The emphasis has been on simple data entry. The best time to gather physical farm information is when paying accounts, as the invoices are usually available at that time. Information such as tonnes of grain or fertiliser purchased and milk production details are best recorded when accounting records are made. Farm Cash has been designed to be a simple farm cashbook programme where minimal computing or accounting skills are necessary. Farm Cash can produce a comparative farm analysis report at the press of a key rather than spend many days retrieving long forgotten information. In addition, Farm Cash can determine the amount of grass eaten per hectare; an important indicator of dairy farm efficiency. Along the way Farm Cash records financial transactions in a way where records can be presented to your accountant on hard copy or disk, to allow preparation of taxation returns. Stock numbers can be recorded at June 30 each year so that guess work is not needed months later when your tax return is being prepared. 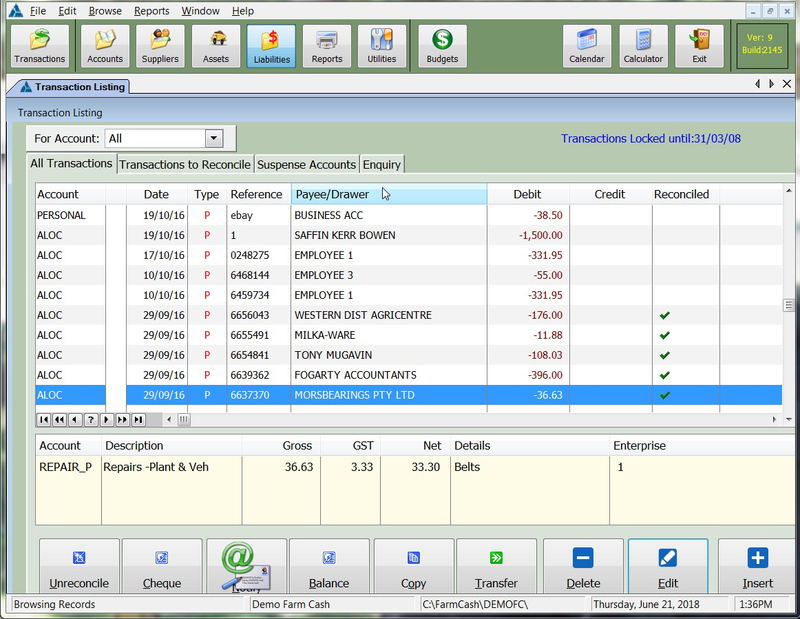 Bank reconciliation is performed simply and a report produced to indicate that the bank is balanced. An added advantage is that reports can be run for any period of time, not just for the financial year. Furthermore, transactions are visible and can be accessed anytime in the future. Farm Cash also allows export of the monthly cashflow into a spreadsheet for budgeting. Reports are menu driven and can be previewed on the screen. > History of grass varieties sown.